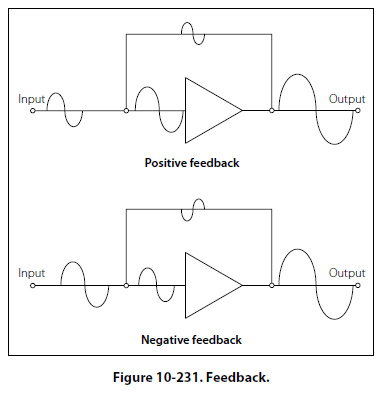 The main difference between these two signals is whether the feedback signal adds to the input signal or if the feedback signal diminishes the input signal. When the feedback is positive, the signal being returned to the input is in phase with the input signal and thus interferes constructively. 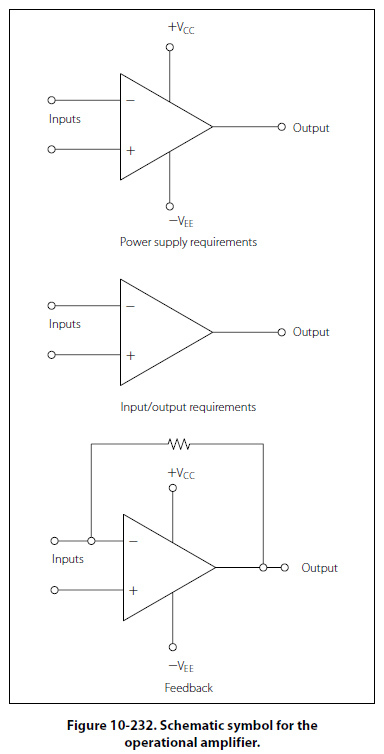 Figure 10-231 illustrates this concept applied in the amplifier circuit through a block diagram. Notice that the feedback signal is in phase with the input signal, which will regenerate the input signal. This results in an output signal with amplitude greater than would have been without the constructive, positive feedback. This type of positive feedback is what causes an audio system to squeal. Figure 10-231 also illustrates with a block diagram how negative or degenerative feedback occurs. In this case, the feedback signal is out of phase with the input signal. This causes destructive interference and degenerates the input signal. The result is a lower amplitude output signal than would have occurred without the feedback. An operational amplifier (OP AMP) is designed to be used with other circuit components and performs either computing functions or filtering. Operational amplifiers are usually high-gain amplifiers with the amount of gain governed by the amount of feedback. Operational amplifiers were originally developed for analog computers and used to perform mathematical functions. Today many devices use the operational amplifier for DC amplifiers, AC amplifiers, comparators, oscillators, and filter circuits. The widespread use is due to the fact that the OP AMP is a versatile device, small, and inexpensive. Built into the integrated chip, the operational amp is used as a basic building block of larger circuits. This type of a circuit can be made up of discrete components, such as resistors and transistors. However, the most common form of an operational amplifier is found in the integrated circuit. This integrated circuit or chip will contain the various stages of the operational amplifier and can be treated as if it were a single stage.